It was just then getting dark with the officer-in-charge and us each on our legal side of the white line that marked base property and certain arrest should we cross it. With U2s and fighter jets flying around overhead, the officer in charge cheerfully insisted we were looking at spider webs. He then asked if we intended to cross the line at which we answered “not tonight”. I was there with my daughter Mahai’a, not quite 18, and we were the new faces on the line. We are no strangers to protest- my daughter’ s conciencious objector file goes back to her crib and stroller. Soon, after light chat, we all said our good nights and a handful of us retreated to a makeshift campsite just yards away in the shadows of the desert vegetation. Barry Binks, a Veterans For Peace foot soldier, has been religiously showing up here at Beale Air Force base, east of Sacramento, month after month. With him is an incredible affinity group of mostly Elder citizens, who have been setting up information outlets, banners, signage and even blockading the entrance to the base, triggering their arrest by the MPs. The dedicated dozen seasoned peace activists there with us this morning, I learned later, collectively had many arrests from Washington DC to California. The primary issue that brings them and us together is drone assassinations but all the activists make no bones about the war machine in general. Beale is the site where Global Hawk reconnaissance drones are piloted from. The drone itself is near it’s target, most notably the Mid East through Pakistan where hundreds of well publicized strikes have blown to pieces children and entire families. We recognized these drone pilots by their black eagle patches displayed on their shoulders as they pass through the gate of the base. Barry explained that these pilots find the targets that reapor and predator drones then strike with a missile. 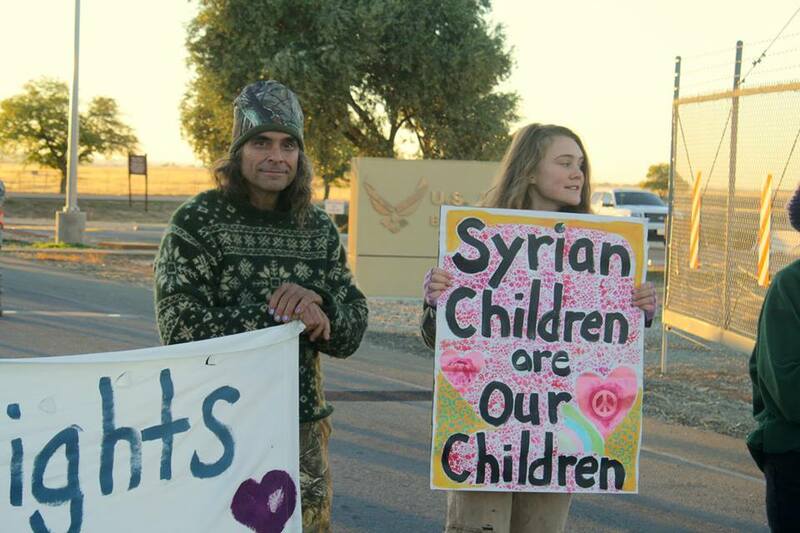 Many of those terror aircraft are flown from Creech Air Force base near Las Vegas, the site of planned protests and actions starting November 9-15, 2014. This group will be meeting up with well known peace activist and former Ambassador to Afghanistan Lt. 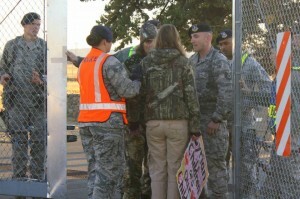 Colonel Anne Wright and other activists from across the nation to spotlight what we all believe to be the war crimes taking place at Creech Air Force Base. Almost two years ago Senator Lyndsey Graham had revealed that over 4,700 had been killed by drone strikes and the White House has suggested that few if any civilians have been killed. The same White House that classified every male of combat age a terrorist. Furthermore, the White House’s word eroded long ago. Since 911 my wife and I, and eventually our children as well, have witnessed one immoral act after the other by Washington in the name of “America(ns)”….in the name of you and me. One lie after the other, from who committed and what acts were committed on 9-11, to the non-existent link to Saddam Hussein, to weapons of mass destruction that didn’t exist, a nuclear hoax, a promise of a fast war, that we would be greeted as liberators, that we would leave the Iraqis better off. That’s just the start…the patriot act, depleted uranium and phosphorous weapons, Guantanamo, Abu Ghraib and torture. And more torture. There was the anthrax letters shell game, BlackWater, Halliburton and pallets of money that disappeared much like Iraqi treasure. The greed and slaughter continued with Obama, presidential ordered secret assassinations, the NSA, telecoms, banks and other corporations conspiring against and committing crimes against US Citizens and the Militarization of the every day cop. But it is the drone strike that makes Americans the most hated people and nation on Earth. It is a cowardly act that disregards whatever rules of war that ever existed in the however misguided “honor” of men. These bombs not only have killed children, teenagers, mothers, fathers grandparents, neighbors and entire wedding parties; they have created a level of anxiety and fear across vast regions. Mentally they are a torture of mass destruction. The pictures, eye witness accounts and journalist verifications on the ground are infinitely more believable than ANY White House in my lifetime. Drone strikes are not a Christian act or the act of any other religion for that matter, except one perhaps and that would be most easily classified simply as evil. Drone strikes are terrorist acts and the United States is the terrorist. The hypocrisy of fighting terrorism with terrorism as a moral detour from the Law of God is so fundamentally flawed that it paves the way for billions of people to easily and justifiably call us Satanic. Before the sun rose our banners greeted the rapid flow of vehicles, including drone pilots, entering the base. We sang spirited songs as wild horses ran ecstatically in the distance. We then all moved into the road and blockaded the entrance and exit. State Highway moved in and huddled with the base MPs. My daughter has stood against war all her life and today was no different. As the guards attempted to avert an arrest and close the gate, effectively completing our blockade, my daughter and I slid thru and triggered our military arrest. We want drones to end and until THAT day, my family wants it to be clear to the victims of drone strikes and to the entire world, that we believe in Peace, not war and consider drone strikes as a war crime against humanity and an act against the Creators greatest gift, the Children of the world, of which we all are. We face a federal judge and she or he will face our Truth. Please Pray for us. Mauro Oliveira is the Executive Director of SOL Communications, a non-profit organization dedicated to raising human awareness.